OSHA recently prioritized enforcement of its excavation & trenching regulations. Local authorities are also now more likely to charge company owners and/or managers with criminal violations when an employee is injured or killed due to unsafe trenching operations. Your highest priority should be to protect your employees, and while doing so you will also be protecting your company’s bottom line. Don’t open a trench without a Competent Person on site and in charge! 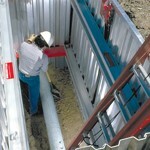 The OCA has developed an excellent training course for trenching and excavation safety. This full-day session is in-depth and intense. Students must pass a course exam. The course includes student reference manual, testing, certification card, refreshments and lunch.